We’re about the halfway through President Donald Trump’s first 100 days, a completely arbitrary goal post in his young presidency. From Trump, there’s a new travel ban — adding to his list of about two dozen other executive orders — a first address to a joint session of Congress, and this weekend, an as-of-yet unsubstantiated string of tweets about wiretaps orchestrated by his predecessor. Journalists, pundits and experts will sort through these developments, hoping at the end they’re not circling a dead cat. In the meantime, here are five important stories that warrant a second glance amid a continuing onslaught of news. 1. Who is the Russian ambassador at the center of last week’s political drama? 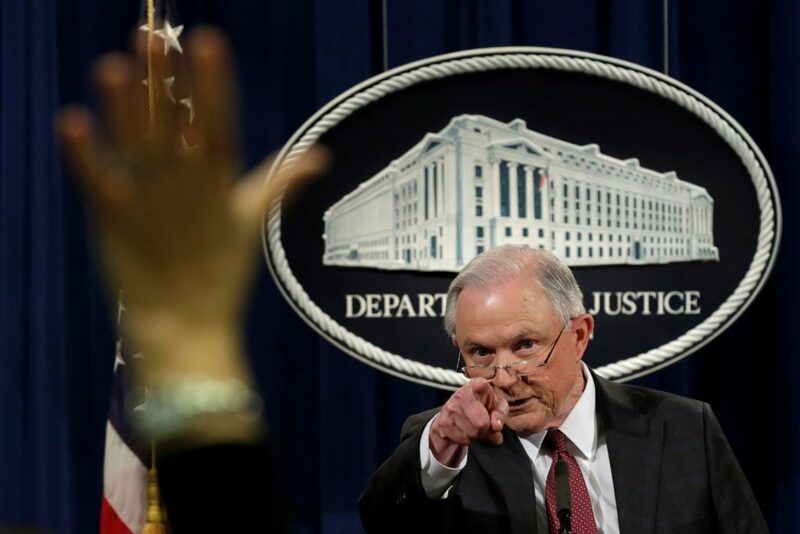 Last week, there were calls — mainly from Democrats — for Attorney General Jeff Sessions to resign following the revelation that he failed to disclose meetings with Sergey Kislyak, Russia’s ambassador to the U.S., to Congress. Sessions recused himself instead. But, in the background, is Kislyak. Michael Flynn didn’t remember him when recounting pre-White House conversations with Vice President leading to his eventual resignation. Sessions didn’t recall him either. And even when a couple of Democrats said they haven’t met with the Russian ambassador, they, in fact, had. When questioned why a 2010 photo showed both House Minority Leader Nancy Pelosi and Kislyak in the same group meeting, a spokesman said she meant she didn’t have a private one-on-one meeting with him. Sen. Claire McCaskill’s own tweets showed she had had communications with Kislyak. Taking all of this into account, the Washington Post cheekily dubbed the Russian ambassador the Most Forgettable Man in the World. A former U.S. ambassador told NPR that Kislyak, an arms control expert, is a “quiet, behind-the-scenes type.” Another former U.S. official told The Guardian that he didn’t detect a “visceral dislike of the U.S.” in Kislyak. 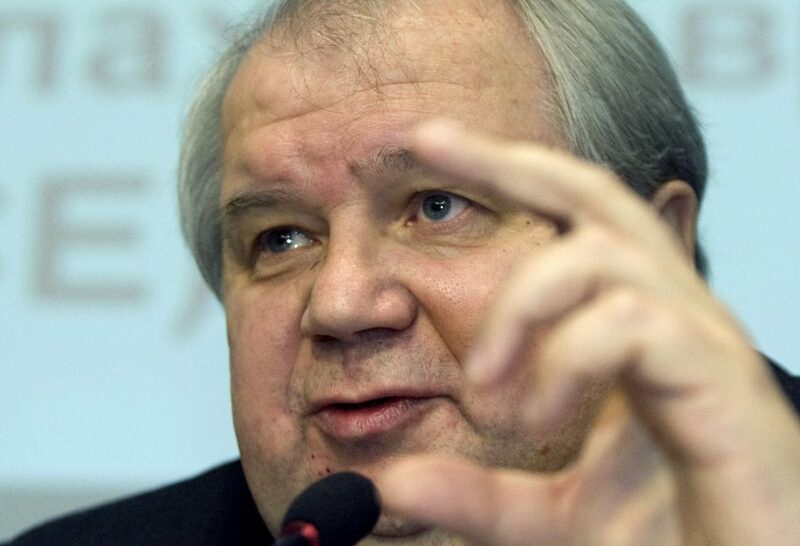 CNN called him a “diplomat’s diplomat,” who has experience stretching back to 1985, during the late Soviet period. Kislyak has been in Washington since 2008, installed as Russia’s ambassador to the U.S. during former President Barack Obama’s two terms. The 66-year-old ambassador was in attendance for Trump’s address to a joint session of Congress last week. To date, as The New York Times pointed out, “nothing has emerged publicly indicating anything more sinister” amid all the reports on contacts between Trump associates and Russia. John R. Beyrle, former U.S. ambassador to Moscow, told the Times he worried that “we’re beginning to out-Russian the Russians” if all contacts were viewed as being suspicious. “That’s the last behavior we should model — that simply meeting with a Russian official is wrong, without any knowledge of what was said,” he added. 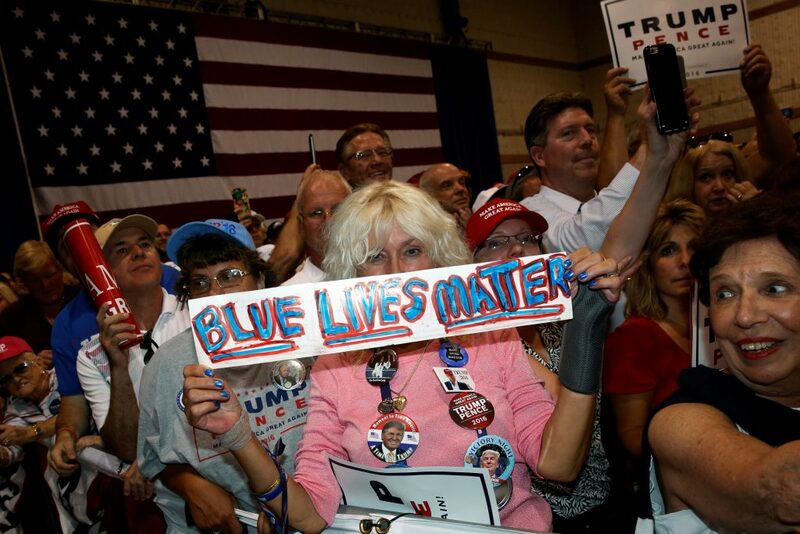 A woman holds a sign reading “Blue Lives Matter” at a rally for President Donald Trump on Sept. 22 in Aston, Pennsylvania. Photo by REUTERS/Jonathan Ernst. Most people have been consumed by what the new president is doing in Washington. But there’s a lot happening in state legislatures, too. Since the beginning of the year, 14 states have introduced 32 “Blue Lives Matter” bills, according to the Huffington Post, an effort to include police and other law enforcement in the groups protected by hate crime laws. Louisiana was the first state to successfully introduce “Blue Lives Matter” legislation last year. It gave prosecutors the power to seek harsher sentences for those who specifically targeted law enforcement in crimes. Since then, a number of other states — including Mississippi, Kentucky and New York — have followed suit. House Republicans introduced a federal bill in 2016, but it died in committee. Twenty-two bills are currently stuck in state committees, according to the Huffington Post analysis. The Blue Lives Matter movement gained traction after NYPD officers Rafael Ramos and Wenjian Liu were shot in December 2014 by a man seeking justice for Eric Garner, a Staten Island man who died after an NYPD officer placed him in a chokehold during an arrest that August. The Fraternal Order of Police have since called for police to be included as a protected class under hate crime laws, as tensions flared over police use of deadly force in cases like Garner’s and the shooting of Michael Brown in Ferguson in 2014. As the Black Lives Matter movement gained traction, some law enforcement advocates have also pointed to a “war on cops,” though several news organizations have used statistics to call that perception false. Still, those tensions — along with some high-profile attacks, including a spree by a lone gunman that killed five Dallas police officers in July — have made police uneasy. These bills are a way to address that fear, something President Donald Trump addressed several times on the campaign trail as part of his law and order platform. The statistics here are complicated. Overall, the number of officers killed on the job has been on the decline. It’s important, too, to distinguish between overall deaths and those by “felonious gun fire” — cases in which a police officer was shot intentionally by a suspect, experts say. In 2015, 41 police officers were intentionally killed in the line of duty, according to the FBI, down from 51 in 2014. That’s a sharp decrease from the 1970s, when the death rate was six times higher than it is today, as noted by the Huffington Post. But an early NPR analysis of numbers from 2016 show 64 deaths by gunfire last year, the highest number since 2011, it reports. The Officer Down Memorial Page counts six fatal shooting deaths of officers so far in 2017. There isn’t a good accounting of the number of citizens killed by police officer each year. An informal tracker by the Washington Post showed 963 people were fatally shot by police in 2016. So far in 2017, that number is 191. Former President Barack Obama signed a bill in Liu and Ramos’ names in 2015, creating a “blue alert” similar to an Amber Alert that would notify the public when an officer has been attacked and provide more information about the suspect. As a whole, “Blue Lives Matter” bills don’t have a great track record: At least 20 of the bills introduced in the past year were killed, the Huffington Post says. Critics of the bill argue that police in all 50 states are already protected by separate statutes that increase penalties for those that attack law enforcement officials. The Anti-Defamation League’s Michael Lieberman told Stateline that those statues are actually a better way to protect police, because they don’t require the same kind of evidence as a hate crime conviction. It’s unclear how this year’s bills will fare. They’re among a number of other public safety bills introduced by Republican lawmakers. Legislatures in 17 states are considering measures intended to better control large-scale protests like those against the Dakota Access Pipeline project and Trump’s inauguration. “You can kind of look at these bills as kind of an indicator of the success that these protesters have had at bringing these issues up to a national level, to the extent that lawmakers feel they have to respond to them,” Washington Post reporter Christopher Ingraham told the PBS NewsHour. The success of “Blue Lives Matter” bills, similarly, could be a reflection of law enforcement’s success in capturing the attention of lawmakers and holding Trump accountable for the law and order platform that helped propel him to the presidency. Ice floats near the coast of West Antarctica as viewed from a window of a NASA Operation IceBridge airplane on October 28, 2016 in-flight over Antarctica. Photo by Mario Tama/Getty Images. Sea ice in Antarctica has fallen to the lowest values ever recorded, according to the U.S. National Snow and Ice Data Center. 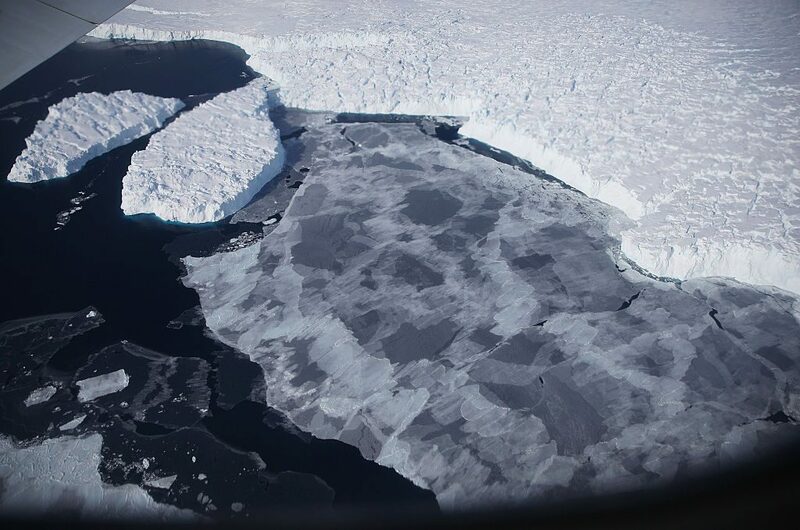 As of March 1, only 820,000 square miles of the ocean around Antarctica was covered in ice — an all-time low for Antarctica since satellite monitoring began in 1979, according to InsideClimate News. Mark Serreze, director of the U.S. National Snow and Ice Data Center, told Reuters there’s still a wait time of a few days for measurements to be confirmed. 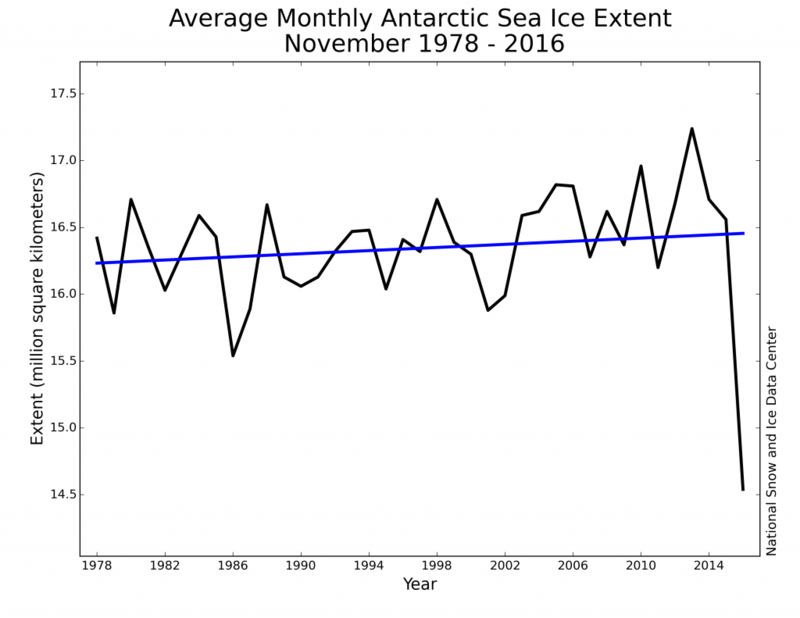 This is confusing because the current low point comes less than three years after Antarctic sea ice set a record high in October 2014, as reported by NASA. And in 2012, Antarctic sea ice hit yet another decline, causing scientists to theorize melting ice shelves as part of the cause of the melting, according to National Geographic. Meanwhile, Antarctica has seen a striking rise in temperature. In 2015, the area reached a new record high of 63.5 degrees Fahrenheit, according to the World Meteorological Organization. At the same time, the Larsen C Ice Shelf, a massive piece of glacial ice the size of Delaware, is also tearing away from the Antarctic Peninsula, BuzzFeed reported. A look at ice levels over the previous decades. Credit Snow and Ice Data Center. So what’s the cause of Antarctica’s wonky climate conditions? Overall, there’s not a clear consensus. Some experts say the instability is what we should expected from one of Earth’s most diverse environments. “The planet as a whole is doing what was expected in terms of warming. Sea ice as a whole is decreasing as expected, but just like with global warming, not every location with sea ice will have a downward trend in ice extent,” Claire Parkinson, a senior scientist at NASA’s Goddard Space Flight Center, wrote in an article published by NASA in 2014. This isn’t the first time Antarctica has experienced bizarre weather patterns. In fact, it’s been happening for decades. 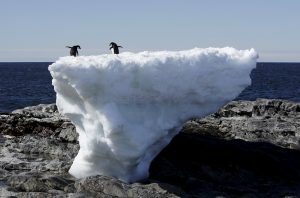 Some attribute fluctuations in the Antarctic sea ice as evidence against global warming — the periodic gains in ice are counter the melting happening in the arctic, climate change deniers say — while other scientists linked the changes to shifts in wind and ocean currents. A 2016 study published in the journal Remote Sensing of Environment found that the topography of the area creates icy winds within Antarctica and powerful ocean currents that circle the continent, which appear to play a more prominent role in sea ice fluctuations than changes in temperature. Scientists have often said the Antarctic has been spared many of the effects of climate change. If this decline continues, it could be a sign that manmade climate change is finally starting to break the weather patterns there, Mark Serreze, director of the NSIDC, told BuzzFeed News. 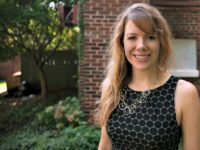 A year and a half ago, Baltimore’s Health Commissioner Leana Wen wrote the city’s 620,000 residents a standing prescription for naloxone, also called Narcan, an opioid antidote that stops a potentially fatal overdose in moments. It was one of the strategies policymakers have used to target opioid deaths in recent years. Others: All states except Missouri now use real-time electronic records to monitor how often doctors prescribe and pharmacists dispense drugs. And states secured $1 billion to fund substance abuse treatment targeting heroin and opioid users through the 21st Century Cures Act last year. Now, as the nation sees a historic rise in fatal drug overdoses, and a new president steps into the White House, the future of those programs are unclear. Over the last five years, the nation’s opioid crisis has gained momentum, despite federal, state and local officials’ attempts to control it. The most recent government data shows more than 33,000 Americans died from opioid overdoses in 2015 alone. Those deaths have quadrupled since 1999, according to the Centers for Disease Control and Prevention. The national drug control policy office, created by President Ronald Reagan nearly three decades ago, has faced political threats before. While advocates have praised the office’s ability to coordinate anti-addiction efforts across federal, state and local offices, critics say billions in spending hasn’t stopped drug use from rising. In Maryland, which ranked 14th in drug overdose death rate nationwide in 2015, that opioid death rate rose 20 percent over the previous year. By September 2016, 70 percent of the state’s 918 fatal heroin overdoses happened in and around Baltimore, state records show. PBS NewsHour traveled to take a closer look at Baltimore, which the Obama administration held up as an example of how a cash-strapped city can forge partnerships at all levels of government and develop new ways to prevent drug overdose deaths, expand treatment access and nurture greater recovery. Since January 2015, the Baltimore Health Department says over 20,000 residents have completed naloxone training; at least 800 lives have been saved. That kind of progress might be lost if the future of funding and the policy office are still uncertain, advocates there say. What Trump’s administration decides to do about those issues could indicate whether he will prioritize drug policies while in the Oval Office. READ MORE: How will the Trump administration change the war on opioids? 5. Are you there, Richard? 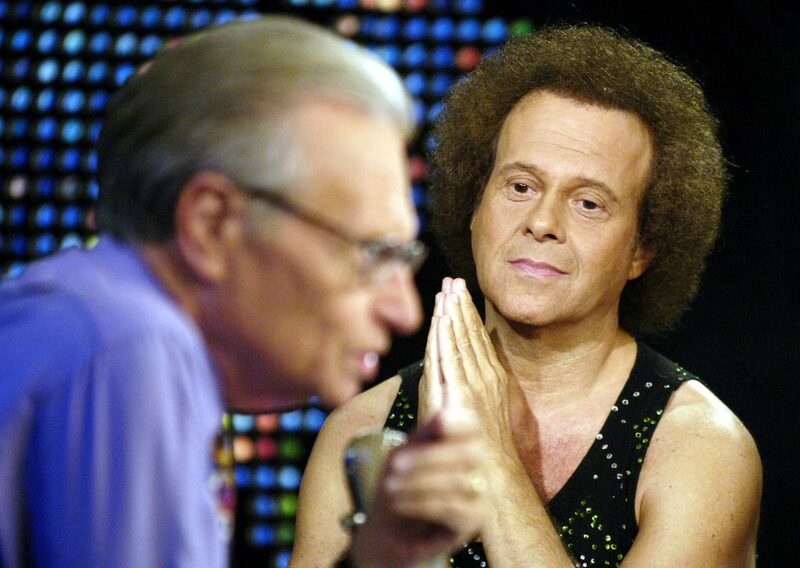 Richard Simmons disappeared from the public around three years ago. The fitness guru, often seen sparkling in tank tops and short shorts, stopped showing up to his weekly classes at his Los Angeles exercise studio Slimmons on Feb. 15, 2014. He didn’t return emails and phone calls. Since then, friends and the many folks he helped on their weight loss journey are wondering what happened to Simmons. Filmmaker and former “Daily Show” producer Dan Taberski, who was also a regular at the Slimmons class, produced a six-part podcast called “Missing Richard Simmons,” documenting his efforts to reconnect with his frizzy-haired friend. “The goal isn’t to drag him back,” Taberski says in the first episode of the podcast. “It’s to find out why someone like him would ditch the world,” he said. Simmons, as documented in the podcast, was an extremely accessible celebrity. A Hollywood tour guide, a once-morbidly obese hairdresser in Nebraska, and many others all attest to this, saying how odd it would be for Simmons to go cold turkey from communication from his vast network of confidants. After a New York Daily News story in 2016 pushed the idea that Simmons was being held against his will by a live-in housekeeper, the celebrity phoned in to the NBC’s “Today” show shortly after for a quick interview. Simmons has yet to return. Wired has called the podcast “kinda icky” and “has the potential to be invasive.” Vulture also aired similar concerns, saying that a moral quandary is apparent as we listen to Taberski Nancy Drew his way through the podcast. “What right does a documentarian, or even a friend, have to waive a person’s right to himself?” Nicholas Quah wrote. For what it’s worth, the podcast does address this. Or, rather, one of Simmons’ friends metaphorically shakes Taberski from his tunnel vision. “He’s allowed to go away. He wants to go away. He wants to live his Marlene Dietrich fantasy and want to be alone? Goodbye, girl,” Willam Belli tells Taberski. “How can you lose what you never owned?” he adds. Correction: This story has been updated with a graphic of declining Antarctic sea ice. It originally contained a graph showing a decline in Arctic sea ice.